This service is granted through The Army, Airforce and Navy Bank of Mexico, S.N.C. 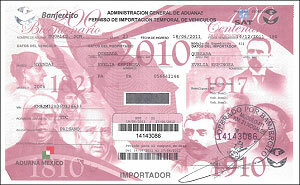 (Banjercito), at the Importation and Entry Control Modules at the border – CIITEV. Banjercito is responsible for issuing the permits and stickers that verify the temporary importation of vehicles, motorcycles, sea vessels and motorhomes. In addition, they process the reimbursement of the guarantee deposit when the vehicle is returned within the authorized timeframe. Who can apply for a temporary importation permit? 2. 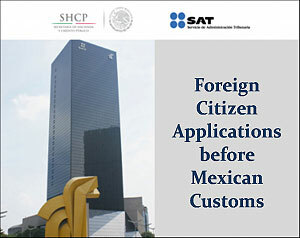 The following Mexican Consulates in the U.S., with six months in advance: Chicago, Illinois; Austin, Dallas y Houston, Texas; Los Ángeles, San Bernardino y Sacramento, California; Albuquerque, Nuevo México; Denver, Colorado ; and Phoenix, Arizona. For the cancellation of temporary importation permit before the beginning of the authorized timeframe, a cancellation letter must be submitted to Banjercito alongside the original permit and hologram sticker. 3. 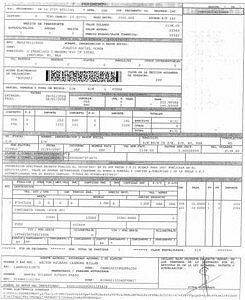 By Internet at www.banjercito.com.mx or www.aduanas.gob.mx , between 10 and 60 days before the entry of the vehicle to Mexico. Only international credit/debit card in the name of applicant (importer) is accepted online. 2. Passport card • Alongside FMM tourist document issued by INM. 5. Lease contract in the name of importer. Each importer by signing the permit, is obligated to return the vehicle outside of Mexico within the authorized time frame. And to not perform acts or omissions that will constitute infractions or crimes by the ill use or destination of the vehicle. In case the authorized term expires and the vehicle has not exited Mexico, BANJERCITO will transfer your deposit to the Mexican Treasury (TESOFE) in Mexican currency and no later than the second working bank day following the expiration of your temporary permit. Who can drive a temporarily imported vehicle? 5. Siblings, even if they are Mexican nationals. 6. By a foreign citizen who is also a Visitor (tourist) permit holder. 7. By a Mexican national if any of the above are traveling in the car. 1. Sea vessels of up to 14.7 feet (up to 4.5 meters long) and their pulling trailer if applicable. 3. Motorcycles or jet skis. All of these must not exceed 3 units and the importer must offer proof of ownership. Motorcycles entering Mexico on their own drive (not towed by another vehicle) and authorized to transit in Federal and State highways MUST adhere to the aforementioned temporary importation procedure; as if they were a freestanding vehicle. 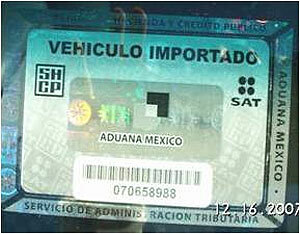 A temporarily imported vehicle CANNOT be sold in Mexico under any circumstance. Copy of the property title. Copy of your immigration form. 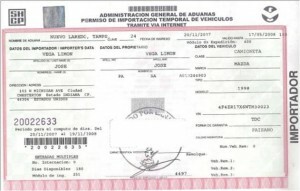 Copy of official valid ID. 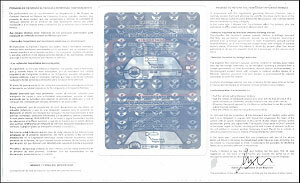 Originals of the Temporary Vehicle Importation Permit and hologram sticker. Foreign citizens can apply for a temporary importation permit for one RV or motor home that is driven or towed. The validity of this temporary permit will be for 10 years with multiple entries and exits. The cost for this permit is $45.00 USD plus I.V.A. * Registration issued by the competent authority in the country or state of origin. You may apply for for a new temporary permit for another 10-year period. This application must be done 15 days prior to the expiration of the current permit, and does note require the physical presence of the RV or motor home. Alongside the temporary importation of the motor home, you may bring into Mexico motorcycles, jet skis or recreational vehicles with the condition of documenting ownership. When additional accessories are brought alongside the motor home, a permit will only be issued for 180 days. Foreign citizens may temporarily import recreational or sport sea vessels such as boats, sailboats or yachts larger than 14.7 feet (over 4.5 meters long); including the trailers used to tow them. Vessels destined to tourist passenger transport and fishing activities can also be brought into Mexico through a “Temporary Vessel Importation Permit” The validity of this permit is for a period of 10 years. At any CIITEV module operated by Banjercito, located at entry ports, Mexican Consulates or online. In addition, this application can also be processed at the Customs Booths of Puerto Juárez, Quintana Roo and Ensenada Baja California. Also in the local branches of Banjercito located in Mazatlán, Veracruz, Tuxpan, Coatzacoalcos, Salina Cruz, Tampico, Manzanillo, Lázaro Cárdenas, Guaymas, Cd. del Carmen, Acapulco and Puerto Vallarta. Repair parts and accessories may be temporarily imported, to be destined exclusively to the repair or replacement of the vessel. These parts must be registered at any CIITEV Module or online through the Register Form issued by Banjercito. In the same manner, you may send or return overseas parts and accessories corresponding to the repair of the vessel. This merchandise must be registered before their departure at any CIITEV Module or online through the Register Form issued by Banjercito. Banjercito employees will seal and register these Forms. 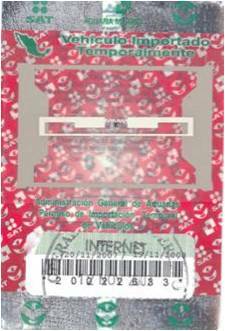 The forms will enable the entry or exit of the merchandise into Mexico. 1. If the deposit was made with a credit/debit card, the refund will be made to the same card used. 2. If the deposit was made in cash, the refund will be issued in cash by any CIITEV Module located at the border. Artícle 95 of the Mexican Customs Law. Rules 3.5.1., 3.5.6. y 3.5.7. of the Regulations of Foreign Trade for 2012. What is the permanent importation of vehicles? Is a procedure by which a vehicle will be able to stay legally in Mexico for an unlimited period of time. This is done through and Importation Request made by an authorized Customs Broker. To consult a list of authorized Customs Agents please visit: www.claa.org.mx, www.caaarem.org.mx; or by phone to 01 (55) 1107 – 8515 and 01 (55) 3300 – 7500. • The vehicle importation must be done at northernborderCustomsofficesormaritimetrafficCustomsports, through an importation request made by an authorized customs broker. • The importation request will be for the vehicle only and cannot support any additional contents or merchandise. • You must pay the required taxes, federal duties and applicable state taxes, just like any vehicle that is sold within Mexico. These fees are deposited into your customs broker’s bank account. • Property title in the name of importer or endorsed to the name of importer as proof of ownership. • Official ID of importer. • Sticker or photo of the vehicle’s VIN number. Who to contact with additional questions?